Okay, so say you need your intern to confirm some (really important) info/question/concern you’ve sent them via email, but they either take days to get back to you or don’t reply at all! Seriously frustrating. What are they doing?! As a Millennial myself, I know we’re never far away from our phones so…. why can’t we just shoot back a response which will probably only take 30 seconds?! TIP 1 – To Millennials, email ≠ URGENT. According to research, email use amongst Millennials is on a rapid decline – we prefer texting and messaging apps, things like WhatsApp, slack or snapchat. Of course, we still use email but it tends to be for more formal situations and we rarely use it for something that we think needs a fast response. I personally prefer people to email me for work reasons, but text me if they need something urgently. My email notifications are usually turned off – the last thing I want is to see a work email when I’m trying to relax out of office hours. But I ALWAYS check my text messages. Text them instead – if like me, your interns are happy for you to text them, set up the system I have. When The Simplifier’s CEO sends me a question via text, I reply ASAP, no matter what time of day/night. Just don’t go overboard and only when you really need a fast response. TIP 2 – Set a company-wide communications policy. While texting can help, Interns do need to learn email etiquette for business which means that you need to set expectations. Just remember that they may not even realize how much their slow email response time bothers you! If they have never worked in a professional environment before, there is a good chance that they’ve never needed to deal with emails the way you do in your firm. Nowadays, colleges and teachers typically don’t send emails that need a quick response. And ignoring most of them rarely results in any serious consequences to students, so it’s basically a HUGE cultural shift for them. Just talk to your interns and set expectations. Explain how email etiquette for your business works. If you expect a response from them within 24 hours, write this policy down in your company handbook…go over it at your next team meeting. So, don’t assume they know how fast they’re supposed to respond to emails with questions, both inside and outside work hours. Spell it out…have a conversation together as a team. Does this communications policy for emailing, texting, using a project management platform like Trello or Asana, etc, etc work best for our communications flow in this day-in-age? Get everyone onboard and on the same page. TIP 3 – Be a better email ninja. Some people seem to be total EMAIL NINJAS…they’re really good at crafting simple, concise emails that get fast responses. Like my boss, Mary – the CEO of The Simplifiers. stays on topic, keeping the text clear and direct…zero rambling on. All of this makes replying much, much easier because I can see exactly what is needed from me and when. It’s too obvious to ignore. Follow Mary’s lead and keep your emails clear, concise and to the point. Put key points and deadlines in bold. 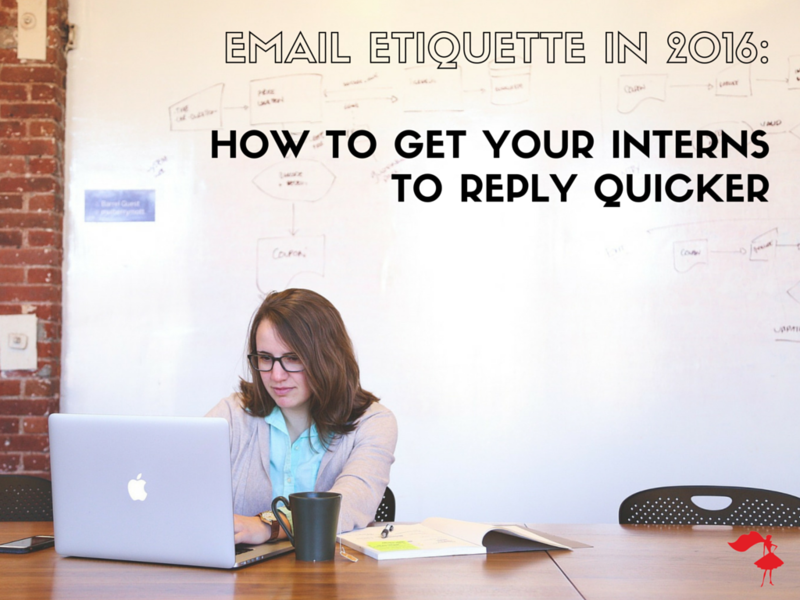 Have you had problems with interns not replying to emails? Have you found any other effective solutions? Leave us a comment below and share your email best practices. Just $75/intern per semester for our custom-crafted training, guaranteed to get your interns up to speed with the way your firm plans and produces events.